The Venetian bridge Ponte di Rialto as seen from a Gondola on the Grand Canal in Venice, Veneto in Italy. The Venetian Rialto Bridge in Venice, Veneto in Italy is the oldest of the three bridges crossing the Grand Canal. The very first bridge was built on pontoons in 1181, it was probably necessary because it linked the Mint to the western side of the Canal. This bridge was appropriately named Ponte della Moneta. Photo of the Venetian bridge Ponte di Rialto spanning the Grand Canal in Venice, Veneto, Italy in Europe. ... 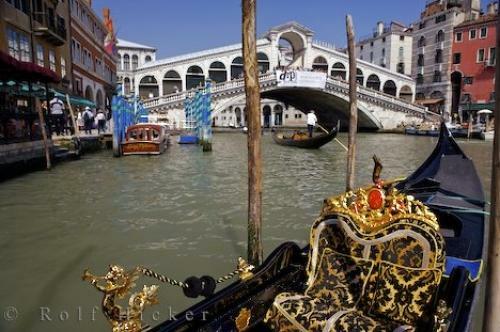 Designed by Antonio da Ponto, it is a beautiful sight when drifting along the Grand Canal in the romantic gondola. The two covered ramps of the Ponte di Rialto in Venice, house rows of shops culminating at the central portico. There is so much to see in Venice, Italy but the Venetian Ponte di Rialto bridge should be at the top of the list. Ponte di Rialto, Rialto Bridge, Grand Canal, Venice, Veneto, Italy, Europe.